I hate to do this. This was supposed to be the year we didn't look at mock drafts in October. But we're 2-5 with a tough Saints team up next. So it's probably time to talk about the draft. Whether it's through the draft, FA or both we need pass rush, pass rush and more pass rush. Then we need help on the back end. I don't even want to be talking about this yet. ? Bradley Chubb welcome to Tampa Bay. Rounds 2 should go best CB available, and then round 3 double dip for another DE. I would be totally happy with this. I'm also a big fan of Clelin Ferrell. #99 of Clemson that guy has a nice get off and will probably have elite measureables. Sophomore RS but has 2 years of film like Vic Beasley JR. and he turned out fine. Chubb, Ferrell, and Key are my top 3 in order. He's got three QBs going before us and us taking Barkley. 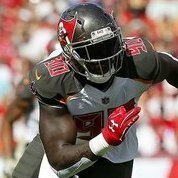 Im not a huge fan of Arden Key for the scheme we are in... I think he is strictly a 3-4 OLB The other picks are on point though I am a fan of Jaire. He's a ball hawk and also is a decent returner he is also a willing tackler in the run game. More of a fit for a zone scheme so as it stands would fit the defense atm but is obviously subject to change . I haven't heard much about Harrison but its a need so im good with it lol.